So many people do not feel happy, successful or satisfied with their lives. Perhaps, as author Atticus Aristotle writes, they have not set their minds on a specific goal. Do you underestimate your potential? Do you feel unhappy because of challenges or circumstances you face in your life? We all have our ups and downs and it is great to have a resource to help lift us up when we need it. I recommend you pick up the FREE KINDLE of Success and Happiness – Quotes to Motivate, Inspire & Live By. You will find advice from some of the most famous people in history, from The Buddha and Confucius to Gandhi, Helen Keller and Martin Luther King. The subjects covered range from Character and Karma to Anger and Desire. This is a great book to skim through for a thought for the day, to overcome fear, release anger or resentment, or to be inspired to keep fighting for what you believe in, especially in the political climate we now find ourselves in. 1) What inspired you to put all these quotes from diverse times and places and subjects together in one book? It was actually the mortgage crisis that inspired me. That crisis brought to light the lack of ethics and morals not only in the banking world but also in the schools that produced graduates who would go on to run these banks. 2) Why do you think our minds are our most powerful tools in achieving success, and what stops us from achieving success? In my opinion, and based on personal achievements and observation of others, when we set our mind toward a specific goal and know deep down that we can achieve it, we usually do. What usually stops us from achieving success is self doubt, when our mind questions our ability. Some people say they were successful because of a parent, teacher or other figure, but what those people do that inspires us is to put us into the right frame of mind, to believe in our self and our abilities. 3) What is the most important message you would like readers to take away from your book? That the right frame of mind can make you soar higher than you thought possible. Many of us never had a mentor who helped us eliminate self doubt or teach us the moral and ethical path. For those of us who go it alone, or need something more, the quotes in the book fill that void to give us that push we need or the moral compass to help steer us. Success and Happiness – Quotes to Motivate, Inspire & Live By is available now for FREE DOWNLOAD at all online retailers. Need to Build Self-Confidence or Self-Esteem? 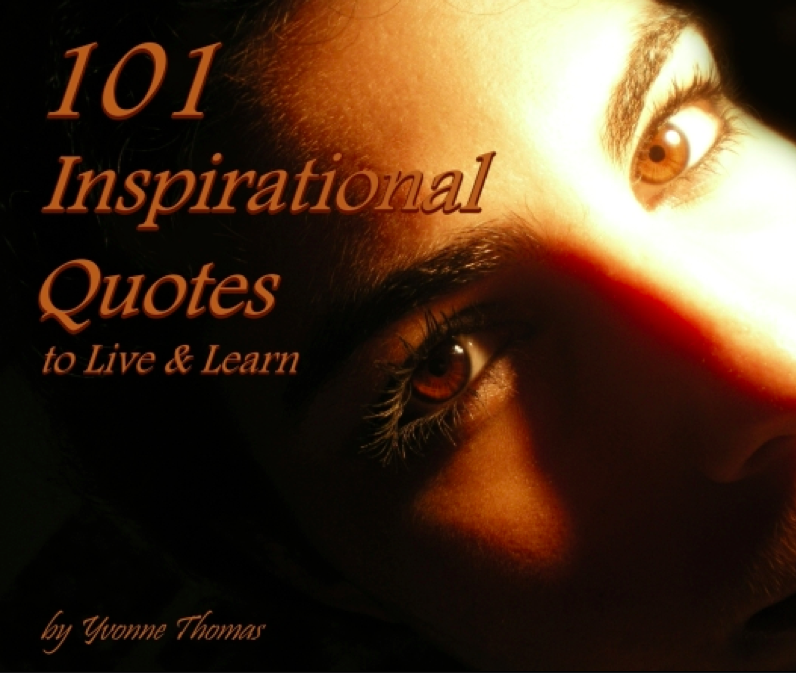 “101 Inspirational Quotes to Live and Learn” by Yvonne Thomas was written to help you approach problems and obstacles more effectively, overcome difficulties, respond to challenges, and continue forward towards your goals in life. Thomas has collected 101 of her favorite quotes and is offering them in a free eBook to inspire you to improve your life, by helping build your self esteem and self confidence. For the other 99, download your own copy to scan whenever you need a little push to take that next step to success. P.S. Yvonne Thomas simply asks that you post a comment on the Wall of ‘Inspirational Quotes to Live and Learn‘ and let her know what you think.